The Whitsundays are a popular holiday destination for thousands of holidaymakers from across Australia and indeed the world. Each year, the crystal clear waters, soft white sand beaches, glorious sunny weather and World Heritage listed Great Barrier Reef draw thousands of visitors to this tropical Queensland paradise. Honeymooners, families and those just looking for a break flock to the Whitsundays to swim, snorkel and sail the famous island group however many fail to witness the best view of the Whitsundays – from the air. There are many scenic flight experiences departing Hamilton Island and two of the most popular are the Reef Discover and Whitehaven Beach Funseeker. 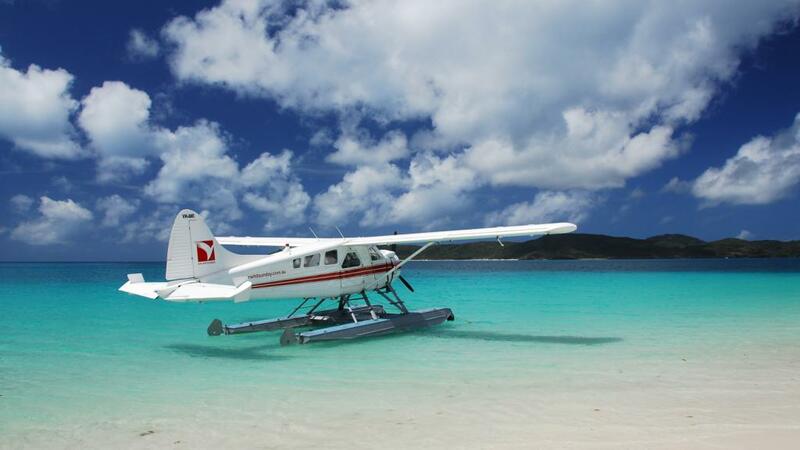 With both seaplane and helicopter options, there’s a Whitsundays by air experience to suit all travellers and budgets. The view from above is unbelievable and although it looks almost too good to be true, your happy snaps will come out looking like a photoshopped version of paradise, although your eyes will tell the truth – it’s all real! Nature at its best. For photographers, a helicopter flight over the Whitsundays is always first on their list. Passing over incredible Hill Inlet, Whitehaven Beach and the Great Barrier Reef is a photographer’s dream, with the opportunity to witness and photograph these incredible nature wonders something that should be on everyone’s bucket list. You can hike the lookout at Hill Inlet, dive the Great Barrier Reef and stroll the soft expanse of Whitehaven Beach but nothing compares to the uniquely beautiful perspective of a scenic flight. Prepare to be overwhelmed by swirling sand, rugged coastline and some of the most iridescent turquoise water you’ve ever seen. Every moment from above is packed with incredible beauty. A birds’ eye view is really the only way to truly appreciate the sheer beauty and expanse of the area. While you may have seen some of these iconic attractions in pictures and on social media, nothing will prepare you for the amazing experience of seeing them first hand. It looks just like the photos you see in the travel brochures – no filters, no editing, it really is that beautiful! •	High shutter speeds will help to eliminate motion blur, especially when using a telephoto lens. •	Burst mode is a great way to capture a perfect frame minus the helicopter propellers. •	Cut glare and reflections by using a Circular Polarizing Filter to best capture the famous colours, patterns and textures of the Whitsundays. •	Above all, don’t just see everything through your lens – remember to enjoy the moment and don’t get caught up in trying to capture everything.